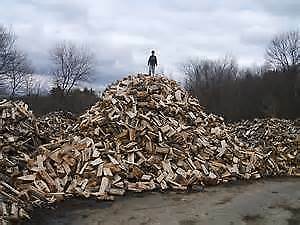 In the standard mixed wood pile you get a variety of wood that includes mainly spruce / pine mixed with other softwoods, along with some hardwoods. Its the stuff that we didn’t sort out that well before splitting and piling. Varieties include Mayday, Poplar, Willow, Spruce, Ash (mountain ash and green ash), and aspen. My father's favorite. This batch of firewood is the real deal premium stuff. A nice mixture of Manitoba Maple, Birch, Green Ash. We also have mixed in all of our apple and cherry wood in here, so there’s more than just the odd piece of the real good stuff that you can use in your smokers. This stuff is solid as heck and dry as a bone. It was not easy to split this wood, each piece has character and is the best you will find in the city. Please be ready to place your order when you call. Delivery time is usually within a couple of days if not same day. We love firewood and hope you enjoy our batch this year, it is the best so far! Thanks to our new and re-peat customers! CALL MAT @ 403-992-6205 TO PLACE YOUR ORDER TODAY!